One of the three exhibits I am looking forward to seeing as I head down to ritzy L-o-nd-o-n (read as ‘lOn-dOn’) bright and early tomorrow morning. 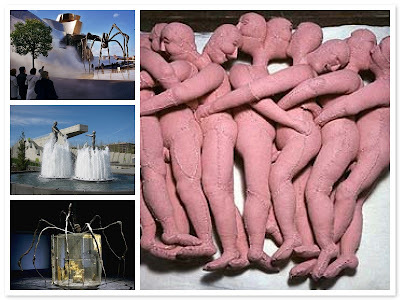 Louise Bourgeois, including her renowned gigantic spider sculpture Maman 1999. The second is Doris Salcedo’s Shibboleth, which I wrote about before, and her phenomenal and unbelievable installations. Lastly, I am looking forward to The World as a Stage. I’m not really sure what to expect with this one, as it is an amalgamation of work from several different artists, however I am curious to say the least. Then if time permits before the fireworks over the Thames, off to Harrods to gawk at what the rich kids do/pay for. Come to think of it, this may be the last time I’m in that big city again for quite a while. Better make it a memorable one. edited: how many typos can a girl have?! I blame the flu. « Wacom – wahoo!!! » Bad Time to do a U.S. Stint?